I usually really enjoy Sy Montgomery's writing and I am a big fan of octopuses, so I was surprised that I didn't get into this more. 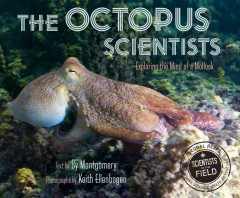 Montgomery follows a group of scientists beginning a research project on octopuses on the island of Moorea. Some of them are researching the animals' feeding habits, some of them are investigating their personalities and psychological makeup, and they are all working towards collecting enough data to analyze whether octopuses are threatened as a species or not. The text is interspersed with stunning underwater photographs, lots of octopuses, and other shots of the island and research materials, like the shells and bits from the octopuses garbage piles. There are sections explaining different facets of the animals' biology, like how they change color and their influence in history and culture. Interviews with the various scientists are interspersed with the story of their research. There's a sum of the team's research and questions still to be answered at the end of the book, as well as a bibliography and index. 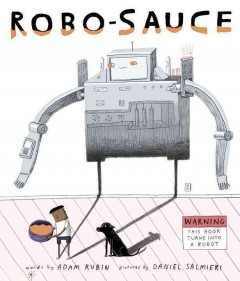 Verdict: So, I like this series, this author, and this animal. 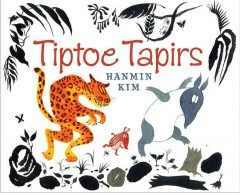 But somehow the book just didn't engage me and I kept comparing it to Montgomery's stunning Tapir Scientists. I didn't feel as interested in the various scientists and the story of their research seemed cut short. I wouldn't not recommend this, but I was disappointed that I didn't get into it as much as I wanted to. I may be feeling a little wishy-washy today. 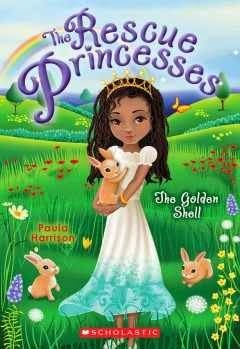 I am looking for more fairy, princess, sparkly, fantasy books for beginning readers with diverse characters, a la Rescue Princesses. 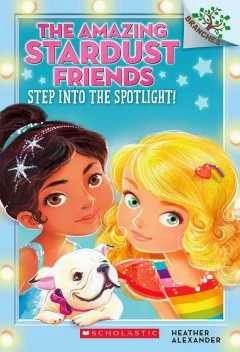 Rainbow Magic is ok, but the only diversity aspect is the characters' skin color on the covers and every book is exactly the same. Mermaid Tales is very popular, but like Rainbow Magic the only diversity is the girls on the covers and there's even less variety. Rescue Princesses is awesome. 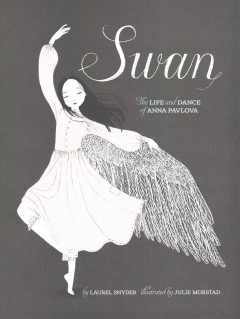 It's got the princess factor, it's a good reading level, and it features a diverse cast of characters and cultures in a simple, kid-friendly way. It's also got girls who go on adventures and rescue animals! Pretty much all my girls love this, but I've also gotten enthusiastic responses from parents, especially a couple big families with adopted children who want books that their kids can read to spark off discussions of their birth cultures. And, we've already got suggestions! This week at the library; or, Vacation! I only worked Monday this week. 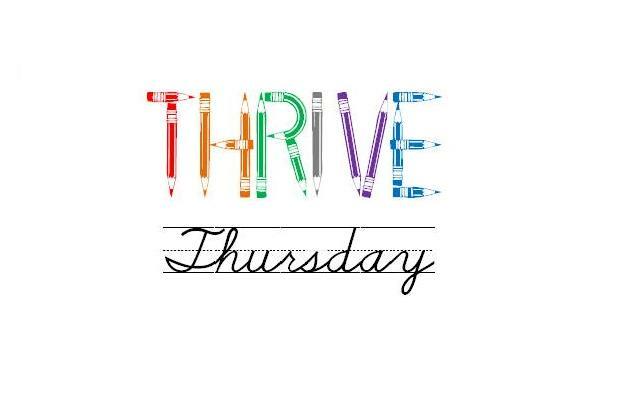 We had a staff meeting, a programming/departmental meeting, and I worked the information desk in the evening while Ms. Pattie did Tiny Tots. I hopefully got enough stuff settled that the rest of the week (the few days we're open) will run nicely without me. Vacation plans: Laundry, planting more bulbs, cleaning out craft supplies, dishes, writing reviews, walking, breakfast with a friend, more cleaning, more writing, and catching up on reading. Also, lots of audiobooks. Lulu just gets better and better. 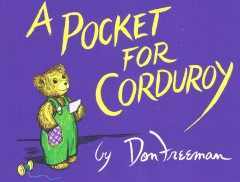 My favorite used to be Lulu and the cat in the bag but I think this is my new favorite. Lulu, who loves pets and is allowed to have as many as she wants as long as she takes care of them, acquires a hamster from a classmate who has been treating it with indifference and is planning to abandon it. Under her care, Ratty begins to be more friendly and settle down in his new home. But then Lulu and her cousin and best friend Mellie are invited to spend the night at Nan's house. This would be great news, but Nan does NOT like pets in general and most definitely not rodents. Lulu and Mellie decide to take Ratty along anyways, but things quickly go wrong and there's a big disturbance in the night. What will Lulu and Mellie do and how will Nan react? I love Lulu. In each book she seems to be maturing a little, but she maintains her enthusiastic love of animals. McKay's turns of phrase are charming as well "They followed after Lulu in a prowly golden parade." was one of my favorite images. I laughed myself silly over Mellie and Lulu's exchanges about the penguin show. 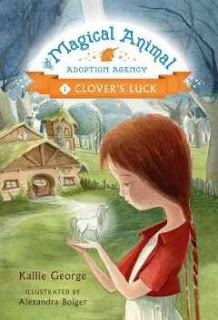 Verdict: Sweet, comforting, and full of animals, not to mention a diverse set of protagonists. This is perfect for fans of Critter Club who are ready to move on to something a little more challenging. 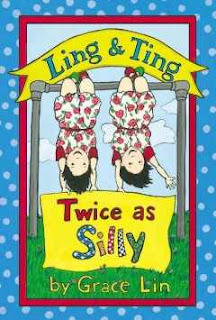 I enjoyed the previous Ling & Ting book, but then somehow forgot about the series. Cybils brought it back to my attention and I remembered how fun it was. As the title says, this is all about being silly. Ling and Ting get up to all sorts of silly tricks and jokes from planting cupcakes to a silly plan to get an apple or even writing a silly story. Lin's art is simple but sweet. The slightly bumpy lines give it a homemade feeling that's very attractive. These follow a classic easy reader format. Simple, short sentences with a surprise at the end of each brief story. The text is a level 2 or 3, depending on what system/publisher you're looking at and I'd say is just right for an intermediate easy reader. 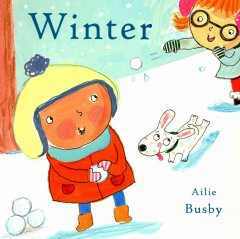 What I really like about these books, besides the humor and general fun, is how the girls' culture is seamlessly part of the story. The clothing and backgrounds make me think the story is set in an older time period, maybe 1950s or 1960s, and it's like someone went back in history and wrote a book about the kids that were always there but nobody noticed. Their culture as Chinese-Americans is included in little things, like painting toys red for luck, but they don't celebrate specific holidays to show their ethnicity (a tired device as far as I'm concerned). The focus of the story is on the humor and how the girls are the same and different as twins. Verdict: While I mostly focus on purchasing easy readers for younger readers at the very beginning of learning to read, I do have a smaller number of classic and carefully selected easy readers for those who are more at an intermediate stage. Ling & Ting is a series that fits in well and I definitely recommend them. I am so pleased to see that another Playtime with Friends book has come out. I'm usually not much of a "cute" person, but I really liked Oliver's Tree and was excited to see what happens to the next featured friend. 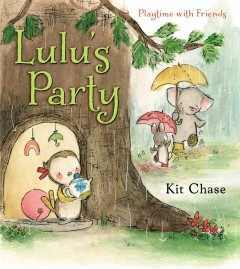 Lulu is feeling a little dismal and lonely on a rainy day and decides to invite her friends over for a party and a special surprise. But the treat gets ruined! Is her party ruined too? Fortunately, Lulu has some good friends who can think of a special treat that they can all share together. Kit Chase's art has a sweet, British feel to it. It reminds me of Ernest Shepard, handmade stuffed animals, and cozy tea parties. This isn't a ground-shaking book and it's unlikely to win awards. 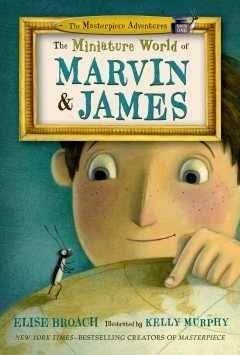 It's just a simple, sweet story that families will enjoy reading again and again and is likely to become a small child's favorite story. 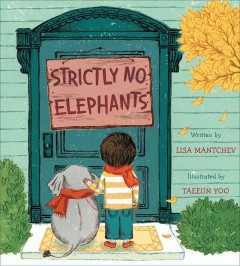 The gentle, hopeful story will resonate with kids who understand about small disappointments looming large and the happy denouement as her friends come up with a solution and they all head outside for a circus party will have them begging for another reading. Verdict: This would make a lovely addition to a book list on resiliency, if your school district focuses on that. 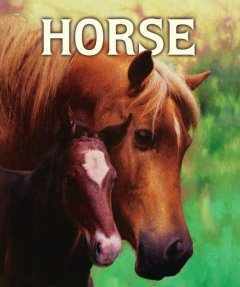 Otherwise, it's the perfect story to cuddle up with on a rainy day. 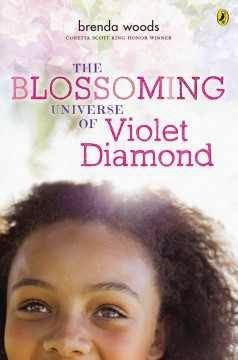 I really wanted to like this book - I'm in the market for more chapter-book-like nonfiction and Ginjer Clarke has done some very serviceable nonfiction series before. However, there were some layout decisions and other elements that made me take this off the list, for my library at least. The rainforest and general terms and concepts are covered in the introduction, then the book is divided into sections covering the Amazon river and the different levels of the rainforest. There are chapters on the native peoples of the Amazon, different products and medicines we get from the rainforest, and how readers can participate in conserving the rainforest. Back matter includes a brief bibliography, lengthy index, and fold-out map. The book is a small paperback size, 140 pages. I like the glossary included directly into the pages and the many photographs and additional information breaking up the text. However, there were a couple things that annoyed me. First, the book is formatted like a journal, complete with water stains, highlighting, and areas on maps and photographs are circled by what looks like red marker. I don't know about other libraries, but this type of book in my library inspires an endless stream of kids to the desk "Ms. Jennifer, someone WROTE in this book!" and those who don't join that stream are busily scribbling on the book themselves, since "someone wrote on it already." 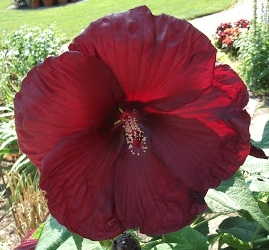 I found several typos; one on page 27 "One night, a water lily blooms a giant white flower that smells like pineapple." and some turns of phrase that I just didn't appreciate, like the anaconda's "fangs" on page 32. Now, it's true that all snakes have teeth of some kind, but I think it would have been better to explain how the anaconda's fangs are used, rather than inadvertently joining in with the "all snakes are venomous and will attack you" sensationalist view. Again on page 40, when talking about piranhas, it labels them "deadly" and mentions that the native people tell stories about them attacking humans, but it's my understanding that piranhas do not attack large prey and only eat humans and other large mammals if they are dead or dying. I'm skeptical about the claim of poison dart frogs having the "strongest poison in the world!" on page 93. Maybe, maybe not, but there's no source to prove it either way. Verdict: So, basically, I liked the idea of the book and the chapter book size, but the journalistic details bothered me and I found myself reading skeptically the information included. 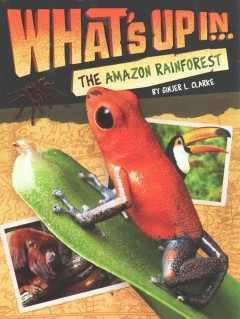 It would probably be fine as an introduction for kids who just want to read about the rainforest, but I can't quite bring myself to recommend it. Practically the first thing that happened on Monday was I accidentally deleted my master calendar for the entire year. Yes. I did this. I can't believe it either. Then I tried to put books on hold for our next Bookaneers meeting and was frustrated that no other libraries seem to purchase the books I want. 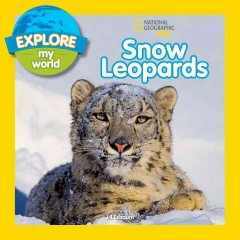 Why aren't they buying National Geographic pre-readers in bulk?? I made it through 5 storytimes on Tuesday, although I lost my voice near the end and got a miserable headache. Friday happened and then it snowed. Started fiddling around with weeding 000-300s. I'm going to update Bible stories next year and there are a lot of things in that section that didn't get updated/weeded when I did neighborhoods - I only did the 398s and 623s really thoroughly (book by book I mean). I made an agenda for our meeting next week. Things are getting real. Emailed a high school teacher with an idea for a new circulating collection, then popped over to talk to her about it. I think it's going to happen! Turned in the paperwork for my mini grant. I won't be able to actually circulate the materials until later - many of them need books or containers and I have to wait until late in December/early January to have the budget to finish them. The most reluctant reader I have ever met has become hooked on Jake Maddox. SCORE! lexiles for a 5th grader, reading suggestions for a reluctant 3rd grader. looks like i'll be getting some more book club attendees! more lexiles. apparently everyone needs points to turn in now. Helped a patron find pictures and information about the state of Virginia. I think for a homework project? I should get the rest of that Arcadia series. At my first book club for 1st - 3rd grade, I asked all the kids what they were interested in. One of the reasons I did that was my plan to introduce them to more books that were centered around their interests. One mentioned gymnastics, so I found a Jake Maddox sports story and took it home to read first so I could booktalk it. "Jake Maddox" is a pen name that includes a number of different authors writing sports stories. Rather like Carolyn Keene or Franklin Dixon. The Jake Maddox sports series feature a wide variety of sports at an easy reading level, featuring both boys and girls and with a quite decent rate of diverse characters as well. 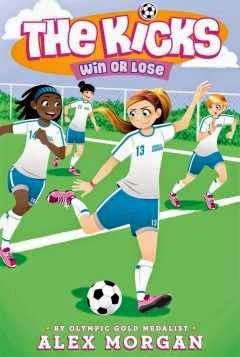 This particular title features gymnastics team captain Dana and her teammates in a lesson on good sportsmanship. They have just one a trophy and are nervous about their next opponents, the Superiors. Supposedly, they play dirty and will do anything to win. They have some little spats but after a talk with their coach the Raiders, led by Dana, take the high road. After a practice where everything goes wrong, their coach gives them the day off. When they come back and compete in the meet, things go great, the Superiors are nowhere to be seen (some of them sabotaged the equipment) and their team wins the gold. 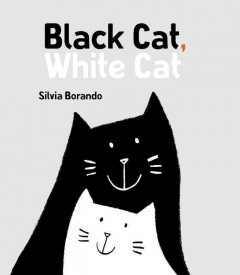 The black and white line drawings show a diverse cast of girls, although all have similar body types and sparkle. No, I don't know how they got a black and white picture to convey glitter, but they did. 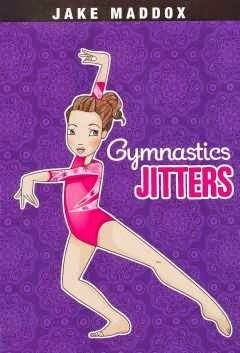 Back matter includes a brief glossary, discussion questions, writing prompts, and some gymnastics facts. This 65-page beginning chapter book is not great literature. The story is a little choppy and the girls are interchangeable, the ending is rather trite and predictable. But that doesn't matter. When I'm selecting beginning chapters, I look for a readable text, engaging storyline, subjects that interest kids, and, if I can find it, at least some diversity. 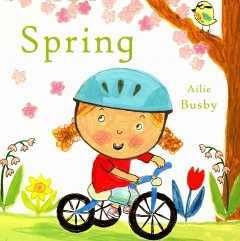 This book may not be as beautifully written or illustrated as some beginning chapter books, but kids at this age need a wide selection to pique their reading interest and this adds to that variety. Verdict: This isn't what most people would think of as a typical book club book, but I'm focusing on letting the kids pick books that interest them. This meets the needs of both my book club readers and my library patrons as well. 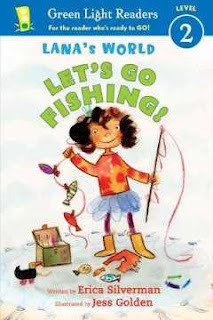 I'd still love to see better-written beginning chapter books featuring diverse kids, both girls and boys, playing sports, but until then I'm perfectly happy handing this out. I recommend that every library have at least some of the Jake Maddox titles. I had somewhat divisive feelings about this book. Mo loves sports, especially football. He's the smallest on the team and mostly sits on the bench, but he keeps practicing even when the opposing team says mean things. Then Coach Steve has an idea to use Mo's small size to help the team and Mo sticks to the plan and wins the game! 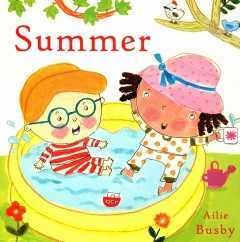 Ricks' illustrations are bright and cheerful. Both Mo and the coach have dark skin and Mo's team has a variety of skin colors, although they're all bigger than Mo. This is a Penguin Level 2, so the text is brief and simple with short sentences and simple, repetitive dialogue. 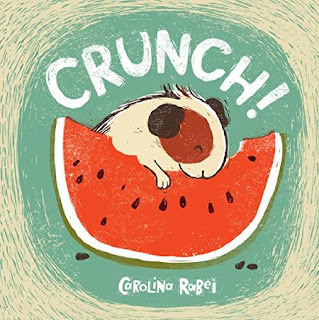 It's great to see more easy readers with kids of color, and more easy readers featuring kids in everyday situations (rather than the never-ending stream of oddball animal friends). 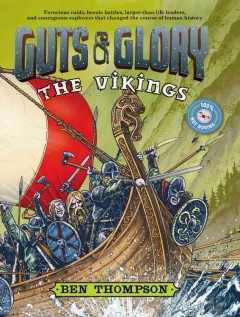 There aren't many sports-based easy readers and I can see this one flying off the shelf. However, I'm doubtful about the realism of the story. I know pretty much nothing about sports, but I can't quite believe that they'd stick one tiny kid on a team where everyone else is twice his size. I've never heard of training kids to catch footballs by smearing butter on them. And the "underdog wins the big game" is an awfully tired trope. However, as I said, I know nothing about sports and classic tropes are still around for a reason - people like them. Verdict: Although I'm a little doubtful about the realism of this, it's a stand-out for the diversity, sports, and everyday kids. 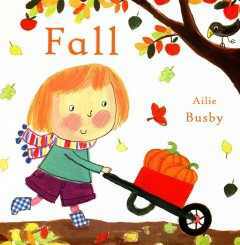 I can't think of anything else out there that's similar so this is a definite must for your easy reader collection.